Join the over 5,300 Island Health employees who play the Payday Lotto! If you’re an Island Health employee, the 50/50 Payday Lotto is your chance to win thousands of dollars every payday! Since 1991, Payday Lotto has raised $6.6 million, with half going to Island Health staff and half to purchase priority medical equipment for our hospitals. 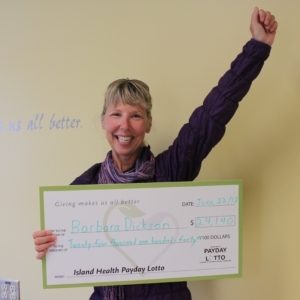 The Island Health Payday Lotto is a great way to support your hospitals. Half of the total funds raised, fund priority equipment purchases at hospitals throughout Vancouver Island! You can sign up for up to three tickets per paycheque draw — they are only $5 each! The ticket amount will be deducted from your pay cheque every pay period. Every lotto participant has to complete a new application form every year. The draws occur every second Friday (on pay day), and are audited by KMPG LLP, 730 View St. in Victoria, BC. The winner is contacted by phone from our team, and wins half of the jackpot. The other half of the jackpot is distributed proportionally to the Island Health Hospitals Foundations involved in Payday Lotto. While the program is licensed by the Victoria Hospitals Foundation, the other Foundations who participate receive the financial benefit from players in their area. This means you are directly supporting healthcare in the region in which you work. The other Foundations involved are: Cowichan District Hospital Foundation, Comox Valley Healthcare Foundation, Lady Minto Hospital Foundation, Saanich Peninsula Hospital Foundation, Tofino General Hospital, Victoria Hospitals Foundation and West Coast General Hospital Foundation. All funds will be disbursed to support the funding of critically-needed equipment in that area or hospital. Anyone who is 19 or older, a resident of British Columbia and a current employee of Island Health with a valid Island Health ID can participate. Please contact us if you live out of province as there are additional restrictions. For more information, please read the full Rules of Play. You can sign up at any time by completing the 2019-20 Lotto Sign Up Form. How do I cancel the Payday Lotto? You can cancel at any time by emailing VHFlotto@viha.ca. How do I know if I’m playing? You will receive a confirmation email and see the deductions on your pay stub. Alternatively you can contact us at VHFlotto@viha.ca. We will phone you! You can see a list of recent winners here. View the list of 2018-2019 winners here. Which foundations are involved in Payday Lotto? Cowichan District Hospital Foundation, Comox Valley Healthcare Foundation, Lady Minto Hospital Foundation, Saanich Peninsula Hospital Foundation, Tofino General Hospital, Victoria Hospitals Foundation and West Coast General Hospital Foundation. Why aren’t I playing anymore? The deductions have stopped coming off my pay stub. Our gaming license requires that all participants renew every Spring. If you don’t re-register, you will automatically be taken off the program. Please complete the 2019-20 Lotto Sign Up Form to register. Tickets may not be sold or purchased outside of British Columbia. Ticket purchasers must be 19 years of age or older and if the winning ticket bears a minor’s name, the prize will be lawfully delivered on behalf of the minor to the minor’s parent, legal guardian, or trustee. If you have any questions about our Payday Lotto process, please contact Jim Johnstone, Development Officer at 250-519-1750 or by email at VHFlotto@viha.ca. Thank you.